This trip surpassed all my other Pinkberry trips in the past. Remember, hubby and I finished a whole Take Home 25oz in one sitting? It was one of the most funny 'couple date' we had. However, my recent visit to the store almost surpassed the former! I can't believe consuming 11 mini cups of Pinkberry frozen yogurt added with 12 toppings plus a regular size of an all-time favorite, signature frozen yogurt. What do you think happened next? Today, I had to set aside some of my favorite toppings (toasted almonds, chocolate shavings, cheesecake bites) for the latest addition. They are the premium gummy candy collection created by International tennis star Maria Sharapova. Sugarpov are unique-shaped gummy candies in the shapes of kissable lips and Smitten Sour Mini, a sour rainbow candy ribbon. 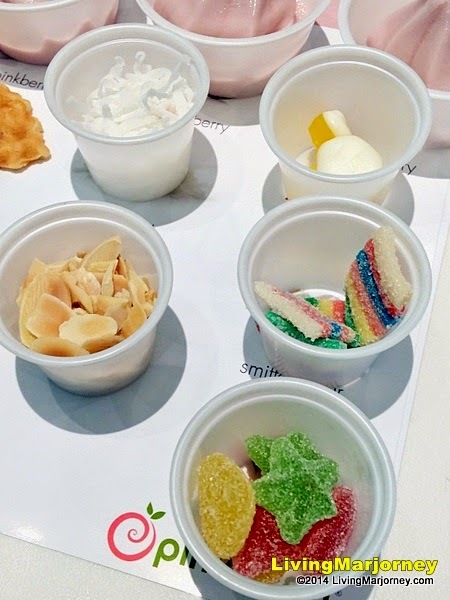 I'm not really a fan of gummy candies but I found them fun and stylish when added to any Pinkberry variant. Our tables were brimming with hearts, stars, stripes gummy candies. 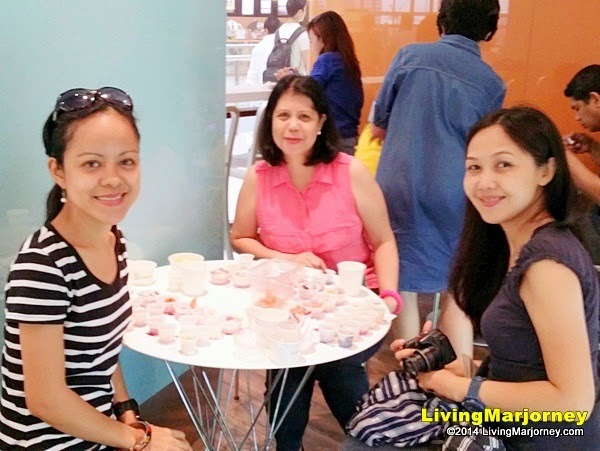 I was excited to try the new frozen yogurts, Pinkberry's Strawberry and Cherry! 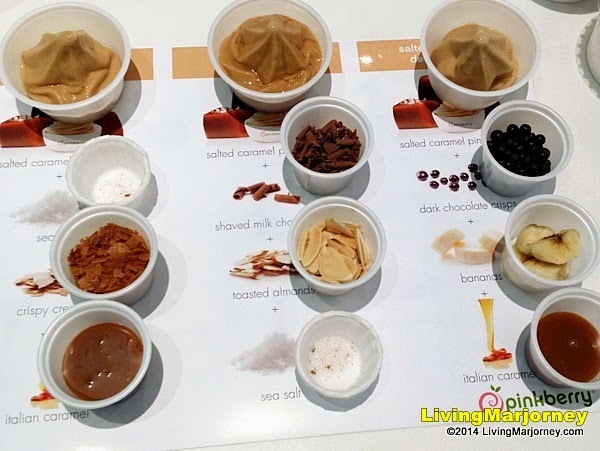 Thank goodness, the original flavor was included during the pairing session. 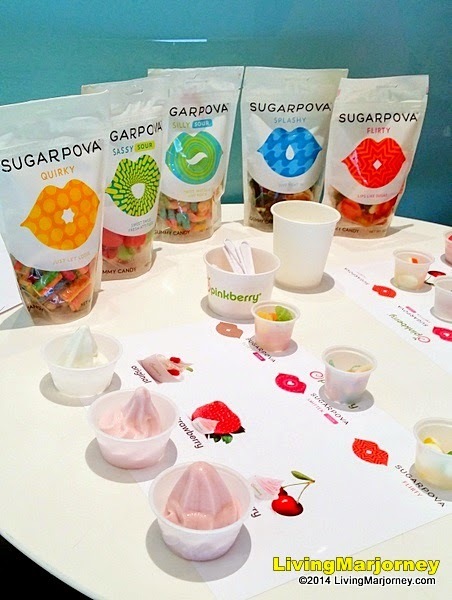 Pinkberry also promised to add Sugarpova Flirty Sour Mini to their line up, a collection of sour fruit-flavored lips, hearts and stars. Here's our first batch of Pinkberry frozen yogurts - original, strawberry and cherry. 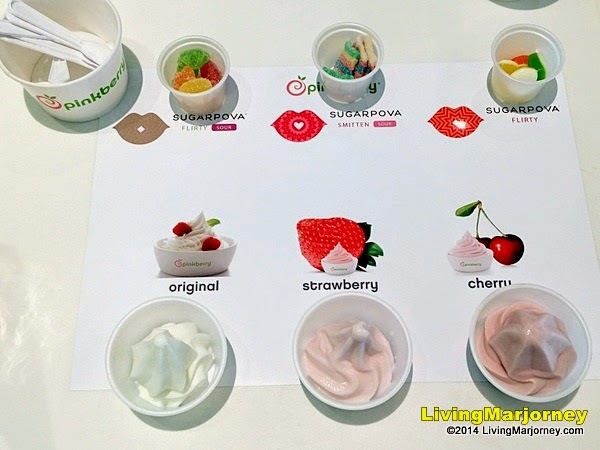 We were given the liberty to do the pairing and decorate with the new line of toppings, Sugarpova. Second batch consist of 5 small cups of Cherry Pinkberry and 12 types of toppings. Mix and match! Tada! Check out my creations! 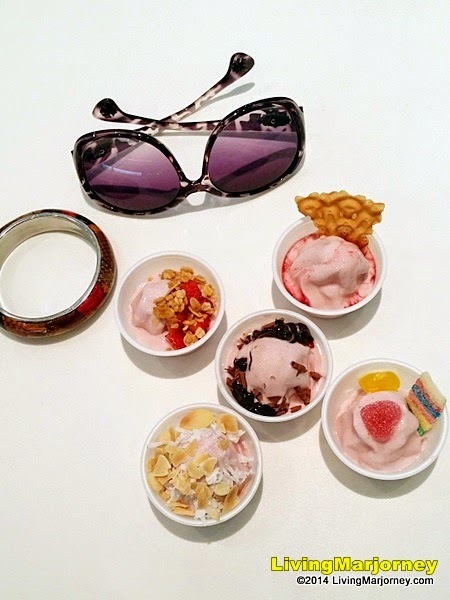 Indeed, the not-too-sweet Cherry Pinkberry goes well with any kind of toppings you would fancy. It has sweet yet light and refreshing finish, the toppings adds crunch and flavor as well. I thought we're done with Cherry and Strawberry Pinkberry. 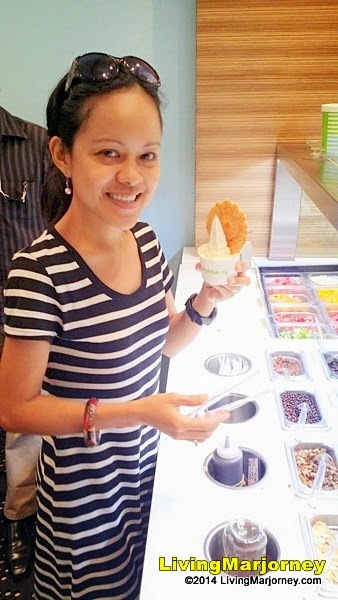 I felt nostalgic when they served us Salted Caramel Pinkberry! It was made available a couple of months ago but then stopped and now returning. It delights me to have Salted Caramel Pinkberry before it leaves the soft-serve machine. It has the sweet and salty, bold, still has a little tangy flavors expected in a yogurt. Oh my, this is to die for! Move over Signature Original Pinkberry, Salted Caramel will be my favorite at the moment! To my excitement, adding toppings to every Salted Caramel Pinkberry took me a few minutes then few shots on my Note 3. I suggest you try it with shaved milk chocolate, toasted almonds and sea salt though. 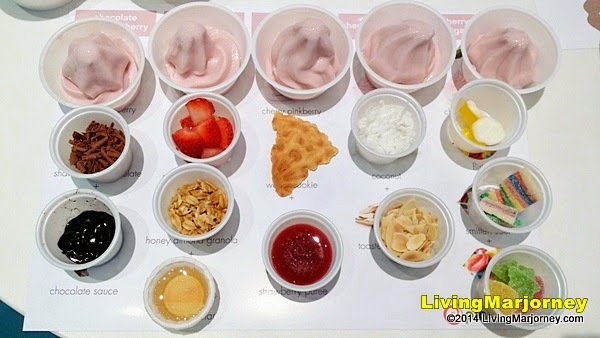 Pinkberry frozen yogurt has yogurt's natural goodness. It's rich in calcium and protein, which helps support a healthy immune system. It also improves digestion. Last but not the least, we experienced creating our very own Pinkberry. Because I had so much Salted Caramel, I choose Signature/original flavor and topped with a huge waffle cookie, toasted almonds and brownie bites. Thanks Ryan for this lovely picture! At the moment, my five (5) favorite Pinkberry variants are the Signature Original Pinkberry (still on top of my list), Pomegranate, Chocolate Hazelnut (replaced for Chocolate), Salted Caramel and Key Lime! 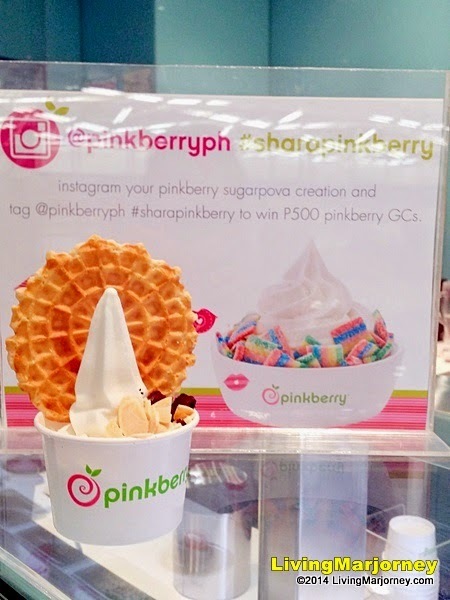 On my next trip to Mega Fashion Hall or Greenbelt 2, I would definitely treat hubby with the new Pinkberry Cherry with sour Sugarpova gummy candies. 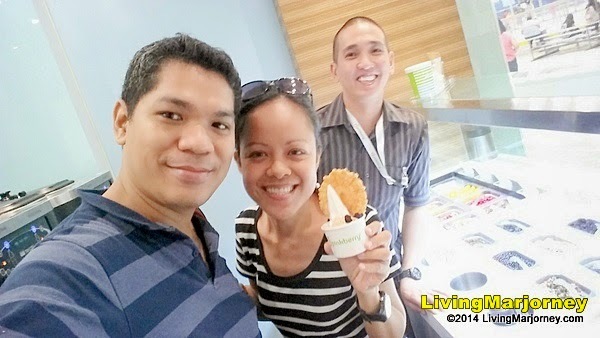 One thing's for sure, I would start the week with a lip smacking, healthy yogurt and Take Home 25oz of Salted Caramel Pinkberry on my visit to Rockwel, Power Plant Mall.